Eleven hundred students put their signatures to protest sexual assault in educational institutions through a signature campaign organized by YPSA-Community Legal Services for Access to Justice Project (CLS). The campaign took place at six different high schools located at six Upazilas of Chittagong and Cox’s Bazar district during 18-29 September, 2016. Simultaneously, YPSA has organized different awareness meeting against sexual harassment in educational institution across the project area. Teachers, students, guardians and School Management Committee (SMC) members were present in these meeting. “Sexual harassment in educational institution is still rife. The High Court of Bangladesh issued landmark directives on the prevention of sexual harassment seven years ago. Despite court orders in this regard, the institutions have not bothered about complaint cells and committees to prevent sexual abuse in the educational institutions as well as our school”, said Mr. Sahabuddin Showkot, guardian representative of Musapur Hazi Abdul Baten High School, Musapur, Sandwip, Chittagong. He also suggests to SMC to make a committee soon in order to prevent sexual abuses. Dulal Bhaterchga, Headmaster, Alhaz Abdul Mabud High School, Hoanuk, Moheshkhali, Cox’s Bazar said, “It’s very hard in Bangladesh to discuss sexual harassment. People aren’t comfortable discussing these issues. But this is something we need to change. Female students should be able to discuss their issues. They must know where they can turn to if they face sexual harassment. They should know where to complain and get counseling. According to headmaster, we also want teachers to be more engaged. The teachers should be more responsive in addressing sexual harassment. This signature campaign bears a big significance”. Finally, YPSA-CLS project staff highlights few steps in Bangladesh to stop sexual harassment; the Bangladesh Police have formed anti-sexual harassment committee in headquarter. In the RMG sector, Bangladesh Garments Manufacturers Employees Association (BGMEA) has formed anti- sexual harassment committees centrally. But still most of the schools and colleges didn’t formed complaint committees. Education institutions need to follow a direction of Ministry of Education. Bangladesh against sexual harassment is a milestone response of the judiciary. The judiciary has acted well to create an enabling, safe and secure environment for women at workplaces and educational institutions. But the real challenge lies in the effective implementation of directives. YPSA-CLS interventions are now working for disseminate the information of directives. 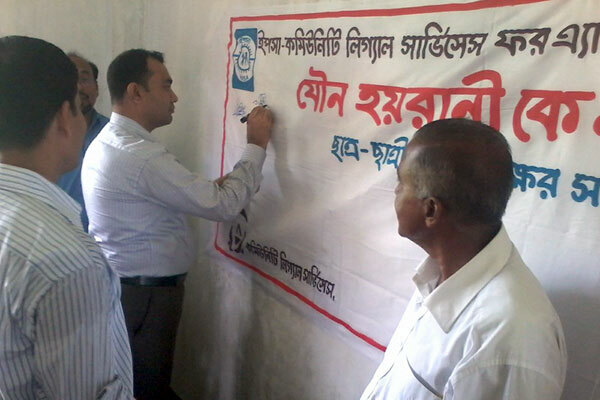 YPSA-CLS project is funded by UKaid and nationally implemented by Community Legal Services (CLS) and locally implemented by BLAST-YPSA Consortium at Chittagong and Cox’s Bazar. Musapur Hazi Abdul Baten High School, Musapur, Sandwip, Chittagong. Student of Alhaz Abdul Mabud High School, Hoanuk, Moheshkhali, Cox’s Bazar shared their willingness on raising hand against of sexual harassment in educational institution. Student of Alhaz Abdul Bashar Chowdhury High School, Betagi, Rangunia, Chittagong.